While I don’t have any plants plying me with pounds and pounds of zucchini right now, it is one of the veggies I can count on scoring cheaply at the farmers market. So it’s time to jump on this zucchini bandwagon. From regular ol’ zucchini bread to zucchini Babka to zucchini fritters, there’s a lot to do with the humble squash. But you know what’s the best Saturday morning post-farmers market option? Zucchini cinnamon rolls, my friends. Like zucchini bread, zucchini cinnamon rolls are sweet and spicy and cinnamony and ooey-gooey frosted deliciousness. I’d say they’re healthy–all that green–but, well, any nutritionist would call me out on that. They’re good for the soul, though, and that’s what really counts. I really don’t know what else to say about them besides go and make them right now. No really, right now. In a large bowl, combine the warm water with the yeast and whisk together with a fork, let stand for 5 minutes. Add the zucchini, soy milk, melted Earth Balance, and sugar in with the yeast, and lightly mix. Sift in the first two and a half cups of flour, salt, cinnamon and ginger, and beat with a mixer at medium speed until smooth. Meanwhile, beat together the Tofutti cream cheese, Earth Balance, vanilla, powdered sugar, and salt. Once the cinnamon buns have cooled enough to eat, frost each bun individually. Same here – I have zucchini growing in my backyard, but with the poor weather conditions this past summer, they haven’t been flourishing Hooray for the farmers market supplying the goods though!! Haha. I absolutely LOVE the idea of morphing zucchini bread into cinnamon rolls – delicious and fun!! oh my god those sound like perfection right now……. eeeeeh, will you come bake for me sometime??? pretty please? 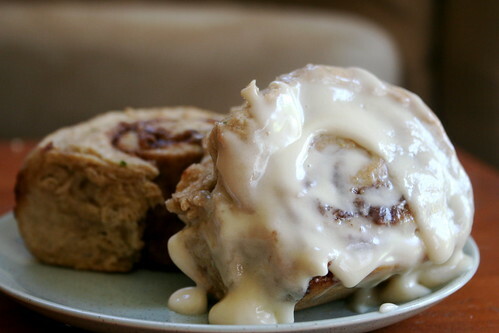 I can’t believe you have the patience to make cinnamon rolls *and* the genius to add zucchini to them, but that’s why you made this post and not me, and why I’m now drooling and wishing I have tofutti around so I could kick the craving you just instilled. ah! good for the soul, indeed! oooh man – i’ve gotta make these gluten-free – they look so damn delicious, Jes! mmmmmmmmmmm! What a great idea!!! Now I’m hungry! A not-so-healthy treat every now and then is definitely good for the soul. These look fantastic! These look amazing. I haven’t had a good cinnamon roll in ages. Fantastic! The poor, ubiquitous end-of-summer zucchini … you’ve done the veggie proud with this one. Something to share with every home gardener pulling their hair out for over planting summer squash. omg those look so good, beautiful picture! I just had a real “duh” moment… Like, why didn’t I ever think of this before? Brilliant! I’m thinking I could even just take my zucchini babka recipe and roll it up as buns. What a killer idea! Ohhhh yeesssss… I just ate one of these (actually, it was like half a pan, but they were covered in frosting and could differentiate between them) and they are the best ever. Lots of filling and frosting, but the dough was to rich or sweet, so it was all goooddddd.